This past weekend, we loaded up the family and headed to Lubbock to celebrate our 22 years of marriage. We had some errands to run and also had a nice dinner together – all 5 of us. It was nice to all be together for an afternoon. One of the errands we had to make was a return to Lowe’s Home Improvement. We had purchased some lights for the house and decided to go with a different style so we had a box to return. Since we had no other business in the store, the family decided to just wait in the car. If you live in west Texas, you know that the last few days have given us horrible winds – sustained 35 to 40 miles per hour both Saturday and Sunday. I mention that fact because after fighting the wind to get back to the car, I found my family watching a run away shopping cart. A lady had pushed the cart to her vehicle, unloaded her items and instead of taking care of business and putting the cart in the cart bin, she simply left it sitting in the parking lot and drove away. The wind began pushing the cart to the east. By the time I got to the car, it had already traveled about 50 yards across the parking lot. So I joined the amusement and began to watch the cart as well. It was headed to the east side of the parking lot where it would be stopped by the curb. But a very surprising thing happened, as it neared the east side of the parking lot, it veered to the left – turning toward the exit. Part of this was due to the contour of the parking lot but much was due to the driving swirling wind. It continued to travel, moving closer and closer to the exit of the parking lot and my mouth fell open. It turned again to the right and exited the parking lot, headed directly across the access road and ended up in the ditch on the other side – still upright. As I have mused over that event, I have been reminded of the power of the wind. Scripture talks about the wind in many different contexts. But the one that seems applicable today is the passage in which we are told not to be tossed by the waves and driven here and there by each blowing wind (you can read it here). We need to be grounded in our beliefs and convictions. We need to know what we hold on to and remember who we trust. 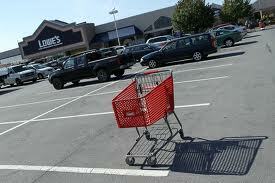 Otherwise, we will be just like that shopping cart – blown right out into traffic and end up in a ditch. Hold fast to your faith – even in the midst of the storm! When was the last time you stopped and gazed at the wonder of a rose? When did you last watch a sunset and feel inspired by the magnificence of God? Jim Dennison made some good points today regarding how great our God truly is. You can link to his post here. We get so busy with our “ant hill lives” that we forget to look up and realize that there is a much bigger world out there and God is in control of it all! Take a minute today and look for God around you. Here it is Monday and I am reflecting on my journey last week and looking forward to where the path will lead this week. Yesterday, we had a great morning in worship. We celebrated with the graduating seniors in our church, we heard the story of one of our senior adults and we praised our ascended savior. We talked about the fact that Jesus died, but was not held in the grave. He spent forty days with his disciples, giving them last minute instructions before breaking all bounds with this natural world and physically ascending into the clouds and out of sight. For us today, we don’t understand how this was possible. But really, neither did the disciples on that day. Acts 1 tells us that they just stood there in amazement – I am guessing with their mouths open. Two angels finally had to show up and tell them to move it along. There are elements of our theology that may not make sense in this world but it does not make them any less true or real. The point I take from this story in Acts is that Jesus proves, yet one more time, that he is not bound by this world. He can come and go as he chooses. That is the God we serve. We simply must have faith and believe. He fills, he bounds, connects, and equals all…. We have to remember that we rarely see the whole picture. What we are living is but a flash of the greater picture – a thread in a magnificent tapestry. Trust and believe today and live into the life God has for you! What Do You Say To a Group of Missionaries? Tonight I have the opportunity to address the group of students, doctors and nurses and sponsors who are on the mission trip to El Paso. What do you say to a group of folks who have taken a week of their time to travel hours from their homes in order to minister to people they have never met? Do you say “thanks?” Honestly, I don’t think any of them are looking for a thank you for what they are doing – certainly not from me. Do you tell them that what they are doing is dabbling in the eternal? That what they are doing will have forever implications and impact? Yes, I should probably say that. That sounds good. But what I am drawn to say is less altruistic – almost selfish and self-serving. But I have thought and prayed about this for a long time. What I am compelled to tell them is that what they are doing may just have more impact on them than any impact they may be making in the life of another person. There is no denying that a result of a trip like this is a renewed passion for Jesus – a boost to our commitment. Some might even call it a “spiritual high.” And if the motivation for making a trip like this is all about what you will get out of it – well then, that just seems wrong. But here is the reality. Yes, we will meet people and we will impact their lives for a day – and hopefully, that impact will have everlasting results to their reality. But at the end of the week, we are leaving – heading back to our reality. We will remember the good things we have done for a time but what difference will it really make? Here is the difference. Getting out of our comfort zones and serving is part of disciple making. It plays a huge part in our becoming. As believers, we are called to be disciples – apprentices. A large part of that process is selflessly serving others. So what do I communicate to the group tonight? I tell them that what they are doing has kingdom impact both in the lives of others and in their own lives. It is part of what it means to be an authentic Jesus follower. Yeah, that is what I will tell them. I am always reminded when I have the opportunity to participate in a mission trip, that God is already at work long before we show up. I remember when I did my first trip like this fifteen years ago or so. I went with the attitude that I had something to give and the people I would see may not know it yet but they needed what I had to offer. In many respects, that is not a total fallacy. I had hope and love that I could offer through my relationship with Jesus that everyone needs. But the reality was, and is still today, God is at work whether I show up or not. God did not call us to go and be the salvation to a group of less fortunate people. But we are instructed to go and share our story. Go and share God’s love. Go and offer hope. You see, when we go and offer our time to minister to others, we are not the salvation they need. We are simply the messengers of the one who is that salvation and that hope. God is at work all around us – we just have to see it and plug in. What do stethoscopes, roofing nails, Bibles, drywall and a dentist chair have in common? Give up? The annual Baptist Student Ministry from South Plains College mission trip to El Paso. This week, about 100 college students, doctors, dentists and others will join forces to offer free clinics, do minor construction and share the love and hope of Jesus to the people of the El Paso area. I need your help. I would like you to commit to pray for the folks on this trip. Petition that God would give us all the energy and passion to be Jesus to each and every person we meet. Sometimes that is challenging – like when the shingles don’t show up on time and all the students are standing around with nothing to do. Or like when you come face to face with the horrible conditions some people live in and you realize that what you are doing, while it is meaningful, isn’t really making much of a dent in what is going on. Pray that God will be obvious and people will see the hope that is offered through a relationship with Jesus. We may have 100 people here, but we need hundreds more all over the world praying for what God is doing. Be blessed today! And thanks for your prayer! Part of my reading today was in the classic, My Utmost For His Highest, by Oswald Chambers. Today’s reading deals with the idea of having our focus on God as opposed to the world or ourselves. Where we put that focus affects everything. Chambers says that once we lose sight of God, we begin to do things in our own power and by our own initiative. For me this is a constant battle. I believe that God has gifted me with certain strengths and passions and expects me to get off my laurels and use those things for the growth of the kingdom. But if I am not careful, it becomes about achievement – about me. Chambers reminds us that the danger becomes reaching the point of not expecting God to show up at all. Is that your expectation for this day? I pray it is so!